Cancun watersports are one of the main attractions for visitors to Cancun owing to the some of the world’s finest beaches and of course the Great Mesoamerican Reef which is the second largest reef in the world. With more than 14 miles of white powdery sand beach and the spectacular reef, Cancun watersports are an enthusiast’s dream. Whether you want to windsurf, parasail, or learn to scuba dive, Cancun is the perfect watersports destination. Cancun watersports centers and marinas are run by extremely professional, expert guides with all the latest equipment and technology. There are over 25 watersports centers, all of which use environmentally sensitive technology to minimize fuel-related contamination to protect the environment. Our list of Cancun waterports centers will show you all the activities available so you can book your program before you go if you wish and include it in your Trip Planner. Jungle Tours are extremely popular, or you can rent a wave runner or catamaran, take a trip on a glass bottom boat or take the plunge and get SCUBA-certified by an experienced dive instructor. Scuba diving in Cancun is so popular because of the Great Mesoamerican Reef (the Gran Arrecife Maya). This is the largest reef in the Western Hemisphere and the second largest coral reef in the world. The Great Mesoamerican Reef stretches from Punta Nizuc, which it at the tip of the Cancun Hotel Zone, all the way to the Bay of Islands in Honduras. This is an amazing 450 miles of coral reef! Cancun’s coastline is home to nearly 100 coral species, 350 molluscs and 164 species of reef dwelling fish. Cancun is also the home to the hawksbill sea turtle, crocodiles, lemon sharks and manatees. All the species are incredibly beautiful and are enormously valuable as an attraction for tourists. When scuba diving in Cancun you can expect to encounter some of the most beautiful sea creatures you are ever likely to see. There are many fascinating scuba diving venues in Cancun for both the novice as well as the more experienced diver. You have a choice of open water diving along the reef and there are also several sunken boats to add to the adventure. If you go inland along the Cancun – Tulum corridor you will find many caverns and cenotes, also known as “sink holes”. Cenote diving or cave diving is a speciality of this region with many Cancun dive schools specialising in this. There are two different types of cenote diving, one is called cave diving and this is when you swim beyond the reach of natural sunlight and the other is cavern diving where you stay within sight of natural light. After Hurricane Wilma many more underwater caves have opened up that you can explore. 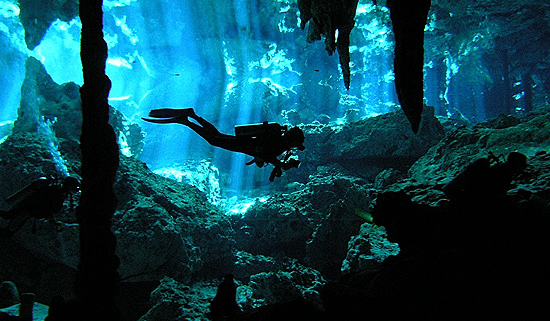 Take a look at the list of cenotes you can explore read more..
To cavern dive a diver must either be a certified cavern diver or be accompanied by a certified cavern diver. Cavern diving courses involve two days instruction and four dives. A full cave diving course is taught over a week with a minimum of 14 cave dives. If you would like scuba diving certification in Cancun there are many certified instructors and dive schools offering PADI certification courses. They will provide you with all the equipment and training you need. Even many of the Cancun hotels offer courses that teach the basics for excursions for those that just want to experience what it is like to scuba dive in Cancun. If you are interested in Cancun scuba diving you can contact one of our reputable dive schools and ask for advice or you can book a course or excursion in advance. Experience the magical underwater world of the Great Mesoamerican Reef with a Cancun snorkeling trip. 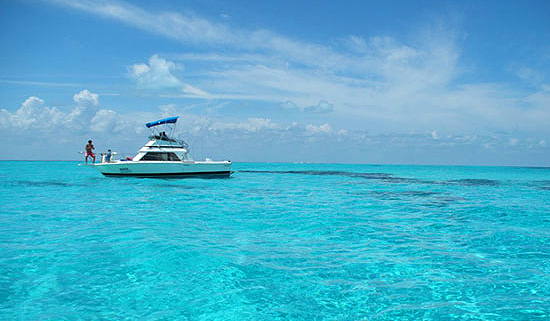 Because of the shallow reefs Cancun snorkeling is the perfect alternative for those that are not so keen on scuba diving. You will still get to see the beauty of the reefs close up. Snorkel trips in Cancun will astound you with the array of tropical fish you will encounter. Grouper fish who change their colour to match the background, flashing from spots to stripes to solid colours as they move from sand to coral are truly amazing to watch. The varieties of invertebrates turn this into an underwater kaleidoscope of colour with corals and sea anemones, jelly fish, octopus, crabs and lobsters. You can snorkel at Punta Cancun near the Dreams Cancun Hotel. You can find beautiful, brightly coloured parrotfish – some of these measuring up to 4ft! Usually you will see two or three colourful females following one male. Lucky him! 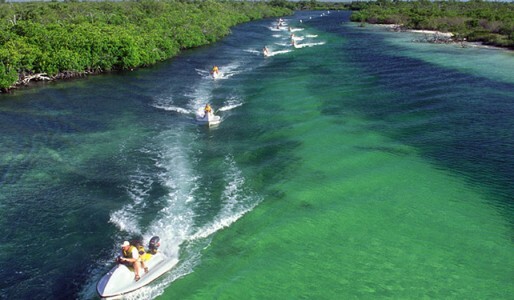 El Garrafon National Park is situated on Isla Mujeres, just a short ferry ride away from Cancun. It is world famous for its amazing reef and colourful fish. You can arrange day trips to El Garrafon National Park through Aquatours or you can catch a ferry to Isla Mujeres and make your own way to the park. Snorkeling in Puertos Morelos is so popular because the reef is very close to the shore and this makes a natural barrier for the town. This keeps the waters really calm and shallow which make it ideal for snorkeling. Stringent environmental regulations have kept this part of the reef unspoilt. Only tour operators that adhere to the guidelines are allowed to offer snorkel trips here. 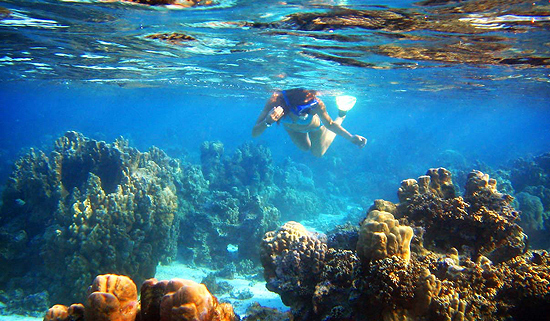 Snorkeling in and around Cancun is a delight for all the family with many places still free or inexpensive. There are many cenotes with crystal clear waters perfect for snorkelling. You could also opt for a day trip to Xel Ha or Isla Contoy or one of our other great Cancun snorkeling destinations with one of our experienced tour operators that will guarantee you an lunforgettable experience. There are fantastic opportunities for fishing in Cancun. The amazing fish found here are due to the nutrient-rich waters found in the reefs in and around Cancun. You can commission private and group charters and they will provide you with all you need such as rods, tackle, bait, licenses and lunch. A special license is required for fishing in Mexico so make sure when you book your tour that this is included in the price. Cancun is one of the best sportfishing hotspots in the world! Sportfishing in Cancun is on a ‘catch and release’ basis and goes in seasons. From February to April the top catches are kingfish, barracuda, small shark, grouper and blue marlin. From April to August you will find blue marlin, sailfish, tuna and mahi-mahi. Then from September to February catches include barracuda, snapper and mackerel. Book a sportfishing excursion and you are guaranteed an exhilarating day out! The lagoon system around Cancun offers the angler all year round opportunities to catch and release a great variety of species such as tarpon, bonefish, barracuda, sea trout, and red snapper. Fly fishing can be done in the sea, lakes, lagoons or rivers and is done in shallow, clear waters using artificial bait called a fly. You can book fly fishing lessons with one of the many tour operators. Fishing in Cancun guarantees a catch of a lifetime in the warm Caribbean waters pulsating with fish all year round! Cancun fishing is just as diverse as its other watersports. You can enjoy fly-fishing, sportfishing and deep-sea fishing depending on your particular passion. Your Cancun vacation would not be complete without experiencing the splendour of the Mexican Caribbean on board your own private sailboat or catamaran. 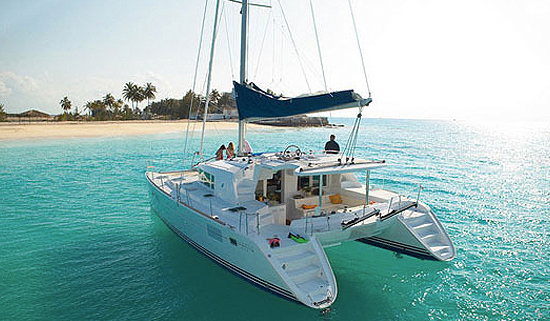 You can charter a boat for as little as one day if you want to. Sail off in the sunrise to begin your private sailing adventure and choose where you want to go. You can discover some of the most beautiful islands in the Mexican Caribbean, snorkel in the reefs, fish for big game in the crystalline turquoise water, or just choose to spend a romantic sunset sail with a loved one or friends. There are many private charter companies in and around Cancun that will provide you with a choice of day trips, or you can tailor make your trip to take you where you would like to go. You can charter anything from 95ft luxury yachts that hold up to 100 people, for weddings or special events, to fishing yachts for a day of sportfishing with friends, or a private yacht or catamaran for the number of days you choose. When you charter a private sailboat or catamaran most tour operators will provide you with a captain and crew, refreshments and beers, meals onboard and snorkeling and fishing equipment. All you need to do is turn up with a hat and sunscreen and be prepared for a fantastic time! We have a list of some of the tour operators you may like to contact for more information on sailing in Cancun and private boat charters. Mexican law prohibits the following practices: touching animals or coral reefs, collecting rocks, sand, seashells or any natural object in the water or on the beach. Those violating these laws may be prosecuted. Be sure to use sunscreen/suntan lotion, but ensure that it is biodegradable to avoid polluting the waters. Always wear a life jacket while practising any watersports in Cancun.